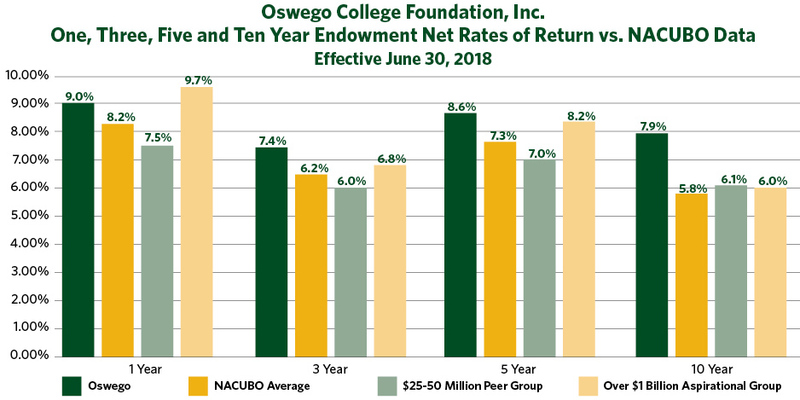 Oswego College Foundation’s endowment investment returns have exceeded the national average for 12 years straight, and for 15 of the past 16 years, according to the latest data released Jan. 31 by the National Association of College and University Business Officers (NACUBO). The results are based on data gathered from 802 participating U.S. colleges and universities from July 1, 2017, to June 30, 2018 (fiscal year 2018). SUNY Oswego’s returns during 2018 were 9 percent, nearly a full percentage point higher than the national average of 8.2 percent. The short-term endowment investment results allow spending rates to be maintained at 5 percent and still cover the current 2 to 2.5 percent inflation rates. That translates to consistent funding for the college's more than 475 privately funded scholarship recipients and the nearly 600 endowed and unendowed funds managed by the Oswego College Foundation, and more money being returned to campus to support academic pursuits and operational expenses. SUNY Oswego’s endowment performed even better when looked at over the past 10 years. The college’s 10-year rate of return stands at 7.9 percent, which is better than the 5.8 percent NACUBO average and even the 6 percent returns of aspirational peers (colleges with endowments of more than $1 billion). Throughout fiscal year 2018, the endowment grew from $33.6 million to $37.4 million, or 11 percent. That enabled the Oswego College Foundation to give $4.1 million to the college to support SUNY Oswego students, departments and programs. These funds come from endowed dollars, as well as annual restricted fundraising dollars. During fiscal year 2018, the college secured 29 major gifts totaling more than $1.5 million, including 15 new donors. The principal amount from those endowed gifts was added to the endowment, and will generate returns to be distributed to students and college programs in the near future. Continuing gains -- Oswego College Foundation’s endowment investment returns continue to exceed the national average with a 9 percent return in 2018, nearly a full percentage point higher than the national average of 8.2 percent. The college’s 10-year rate of return stands at 7.9 percent, which is better than the 5.8 percent National Association of College and University Business Officers average.